African-American educator and newly elected U.S. Rep. Shirley Chisholm gives the victory sign on election night 1968. In 1968, Chisholm defeated James Farmer for New York's 14th Congressional District. She was a New York State assemblywoman, elected in 1964 after leaving behind a career in education, first as a nursery school teacher and later a consultant to New York City's Division of Day Care. Farmer, a black man and civil rights leader, ran as a Republican. The reapportioned 12th Congressional District was largely made up of Brooklyn's Bedford-Stuyvesant community and a few other parts of the borough. Bed-Stuy's residents were mostly African-American and Puerto Rican. It was also Chisholm's home. Chisholm labeled Farmer "an outsider" during the campaign, because he lived in Manhattan. Among her tactics, she spoke in Spanish to Spanish speakers, a language she had developed fluency in as a schoolteacher. She took her campaign to the streets, literally, riding on a truck with a loudspeaker. Making multiple stops, she regularly kicked off her remarks by saying, "This is Fighting Shirley Chisholm." The contest between two black candidates garnered little media attention outside Brooklyn. In Susan Brownmiller's 1970 biography of Chisholm, she described the candidate as distraught over the lack of coverage. Chisholm was concerned that only The Amsterdam News, a black newspaper, seemed interested in covering her near the end of the campaign. But when the final votes were tallied, voters chose Chisholm by better than a 2-to-1 margin over Farmer. Still, media attention remained scant about Chisholm's surprising win. Richard Nixon's narrow win over Vice President Hubert Humphrey dominated headlines and airwaves. Television, radio and newspapers mentioned Chisholm's news in one line on air, or in only a paragraph in print. Her victory remarks from the evening are hard to come by. But NPR recently found a recording held by the New York Public Library. "My dear friends, tonight is a very important night," she told her supporters, "not so much for me, but for you, the people of this community. "After many years of struggle and sacrifices on the part of several of you here this evening, we have at long last been able to elect today a voice that shall be your voice in the halls of the United States Congress." Within a couple weeks of the election, a national black weekly, Jet magazine, put Chisholm on the cover. It wasn't until several months later, when she was a sworn-in member of Congress, that the country began to pay closer attention. In February 1969, Ebony magazine did a cover story. Later still, she was filmed on the steps of the U.S. Capitol by an NBC News camera crew, answering questions from visiting Brooklyn students from her district. In the NBC documentary The Irrepressible Shirley Chisholm, a black teenager asks her, "How do you feel being the first black woman in the House of Representatives?" "I have mixed feelings," Chisholm begins, as she looks at the girl along with her classmates. "First of all, I'm very glad to make history in this country being the first black woman, [but] I don't get terribly excited about it." In 2003, some 20 years after Chisholm left Congress, Tavis Smiley asked her which had been a bigger obstacle during her career, being black or being a woman? "I met far more discrimination being a woman than being black when I moved out into the political arena," she said. "All kinds of meetings and all kinds of groups got together in order to stop me from moving out [into politics]. Because I was very outspoken and very articulate and didn't take guff off anybody." When Chisholm entered the New York State Assembly in 1964, she helped pass unemployment insurance for domestic workers. Rep. Shirley Chisholm was a co-founder of the Congressional Black Caucus. 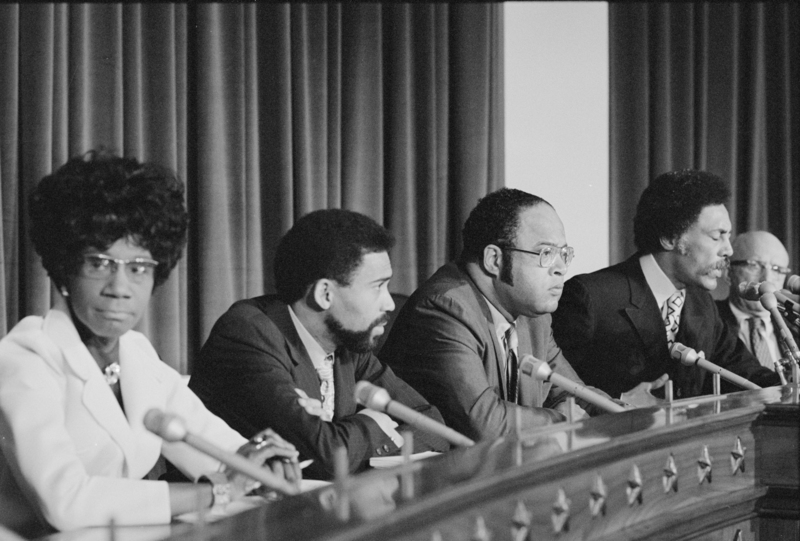 She's shown here in 1971 with caucus members Bill Clay (from left), Charles Diggs, Ron Dellums and Augustus F. Hawkins. Once in Congress, she refused to be sidelined. She fought for Head Start, an early education program begun under President Lyndon Johnson. During her seven terms in office, she co-founded the Congressional Black Caucus, advocated for the Equal Rights Amendment and supported the 1972 Title IX amendment aimed at ending discrimination against women in federally funded education and sports programs. She demanded to be put into positions more relevant to the needs of her constituents back home. She became part of the Veterans Affairs committee. Within three years, she would move on to the Education and Labor Committee. In 2015, President Barack Obama posthumously awarded Chisholm the Presidential Medal of Freedom. "There are people in our country's history who don't look left or right, they just look straight ahead," Obama said. "And Shirley Chisholm is one of those people." At the ceremony, Obama told the story of Chisholm's early battles to be taken seriously in Congress. "When Shirley was assigned to the House Agriculture Committee despite the fact that her district was from New York City, she said, 'Apparently all they know in Washington about Brooklyn was a tree grew there.' "
Retelling her story drew laughs, in part because it encapsulated Chisholm's sharp sense of humor and clarity. In 1972, Chisholm made another history-making move. In 1972, in a history-making move, Shirley Chisholm ran for the Democratic Party's nomination for president. She ran for the Democratic Party's nomination for president. Her dynamic run proved a qualified woman and person of color should and could be taken seriously for the high office. In the 2004 documentary Chisholm '72: Unbought and Unbossed, filmmaker Shola Lynch chronicles Chisholm's presidential campaign and includes interviews with Chisholm reflecting on her life in public office. During the film, Chisholm talks frankly about her legacy. "I'd like them to say that Shirley Chisholm had guts," she said. Fifty years and one day after Chisholm's historic 1968 win, Lauren Underwood, from Naperville, Ill., became the first African-American woman to represent her district in Congress. Underwood, like Ayanna Pressley, the first black woman elected to Congress from Massachusetts, cites Chisholm as an inspiration. Likewise, Stacey Abrams, the black candidate who ran for governor of Georgia this year, says she is proud to be part of Chisholm's legacy. 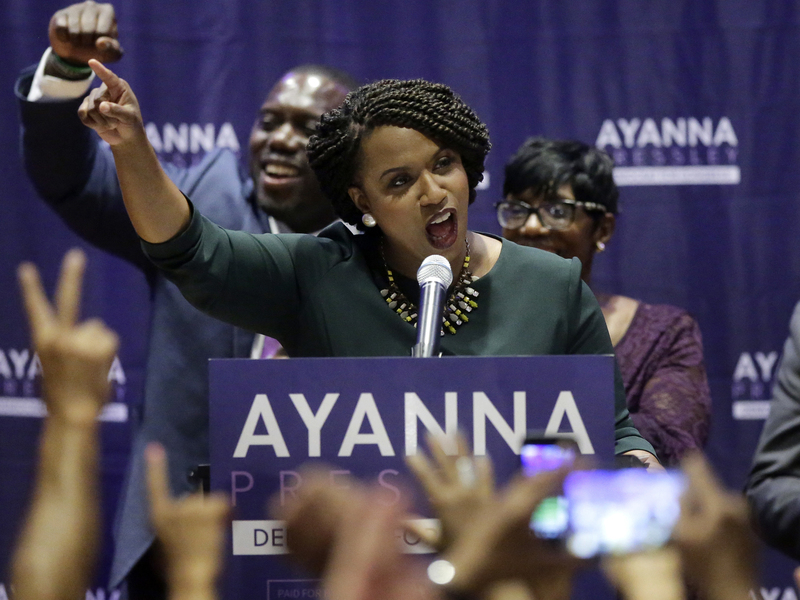 Democrat Ayanna Pressley just became the first African-American woman to represent Massachusetts in Congress. 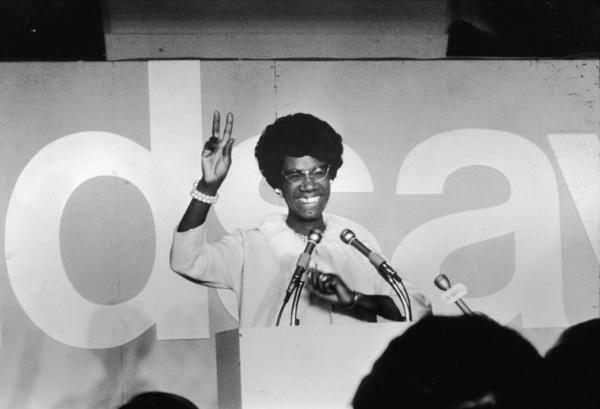 When Chisholm wrapped up her remarks in 1968, she took a moment to share a new reality with her supporters and the Brooklyn residents she was poised to serve. "To black and white Americans, although I'm making history this evening, I love to believe that my victory tonight is a symbol of hope for many of us who never dreamt or never believed that we would have had the opportunity to move out [into politics]," she said. "And I want to say, to all of the marvelous people in the 12th Congressional District, black, Puerto Rican and white, that without your support and without your faith in me, and without your going to the polls today and telling the world that we have our voice, I would not have made it." "God bless you," she said, engulfed by the sound of applause around her. Ayanna Pressley of Massachusetts recently paraphrased the words of Brooklyn's fiery congresswoman. "Shirley Chisholm said she simply wanted to be remembered as a black woman being herself. When more of us do that, we win," she said. Fifty years ago on election night, Shirley Chisholm became the first black woman ever elected to Congress. 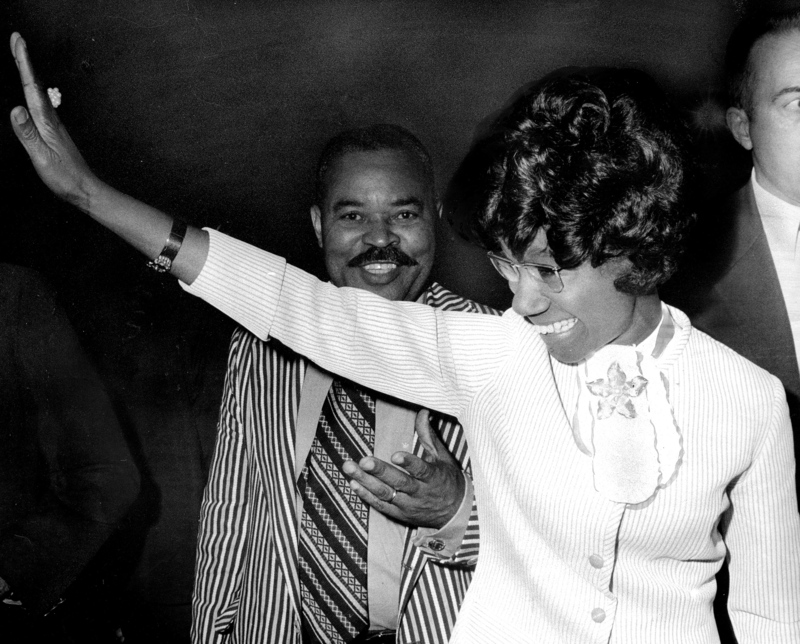 As we continue our series on the events of 1968, NPR's Walter Ray Watson takes a look at Chisholm's victory and her legacy. WALTER RAY WATSON, BYLINE: Shirley Chisholm's election in 1968 barely registered with media at the time. Richard Nixon's narrow win of the White House dominated headlines and airwaves. And few people outside Brooklyn, N.Y., were paying attention to a black woman's campaign. It wasn't until months later that the country started taking notice. An NBC News camera crew filmed Chisholm on the steps of the U.S. Capitol fielding questions from students visiting from her district. UNIDENTIFIED STUDENT: How do you feel being the first black woman, you know, in the House of Representatives? SHIRLEY CHISHOLM: I have mixed feelings. First of all, I'm very glad to have been able to make history in this country by being the first black woman. And boys and girls, as far as I'm concerned, actually, it's overdue. So I don't get terribly excited about it. WATSON: This is from the network's 1969 documentary, a half-hour called "The Irrepressible Shirley Chisholm." Ebony magazine also put her on their cover. But even as she got more press, she found herself fighting for her voice in Congress. Here's what she told Tavis Smiley on NPR back in 2003 when asked which was a bigger obstacle, her race or her gender. CHISHOLM: I met far more discrimination being a woman than being black when I moved out in the political arena. There were all kinds of meetings and all kinds of groups got together in order to stop me from moving out because I was very outspoken, very articulate and I didn't take any guff from anybody. WATSON: Chisholm left a teaching career to enter politics in 1964, winning a seat in the New York State Assembly, where she helped pass unemployment insurance for domestic workers. She then set her sights on federal office. Once in Congress, she fought for Head Start, an early education program. She also advocated for the Equal Rights Amendment and co-founded the Congressional Black Caucus as one of the original nine members. BARACK OBAMA: There are people in our country's history who don't look left or right; they just look straight ahead. And Shirley Chisholm was one of those people. WATSON: President Barack Obama posthumously awarded Chisholm the Presidential Medal of Freedom in 2015. OBAMA: ...She said, apparently, all they know here in Washington about Brooklyn is that a tree grew there. WATSON: The point is, Chisholm, from the very start, refused to be sidelined in Congress. She demanded and got moved to the Veterans Affairs Committee while the Vietnam War was still raging. In 1972, Shirley Chisholm made history again, running for the Democratic Party's nomination for president. Ayanna Pressley is one of many who cite Chisholm as inspiration today. She's poised to become the first black woman to represent Massachusetts in Congress. AYANNA PRESSLEY: Shirley Chisholm said she simply wanted to be remembered as a black woman who dared to be herself. When more of us do that, we win. WATSON: In Georgia, Stacey Abrams, another black woman, is trying to make history in the governor's race there. She says she's proud to be part of Shirley Chisholm's legacy. This is a record year for women running for governor and for Congress. Walter Ray Watson, NPR News. (SOUNDBITE OF DOROTHY ASHBY'S "GAMES") Transcript provided by NPR, Copyright NPR.